Living the busy life I do, combined with late nights working and never ending social media at arms reach, getting my beauty sleep is incredibly important. It’s hard to switch off and get the eight hours sleep I really need to look my best the next day, but I’m increasingly turning to nighttime rituals to get me in the right frame of mind. With a plethora of lotions, potions and oils on my bedside table, it’s often hard to know what to choose when I don’t have the time for a complex and time consuming routine. 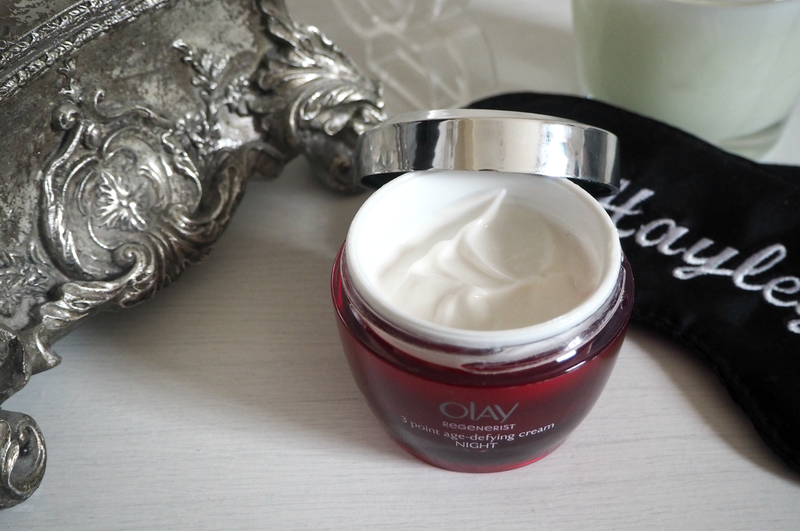 In the interests of keeping it simple, for a number of weeks I’ve been using Olay’s new Regenerist 3 Point Age Defying Night Cream – which works each night to re-energise your skin’s appearance cell by cell. Its unique Skin Energising Technology accelerates the skin’s surface turnover, gently exfoliating away the dull and dry surface cells for much fresher looking skin by morning. Not only does it help to tackle fine lines while intensely hydrating, but it helps provide a radiant glow and re-energised complexion that looks like you’ve had a great night’s sleep – even when you’ve not! It’s fragrance free (so no stimulating surprises,) plus the texture lends itself perfectly to a cheeky little massage around the eyes to flush away any build-up or puffiness that will come back to bite you the next day. Having been using it for a few weeks already, it’s definitely become a favourite. I love the simplicity of it, but equally the fresh-faced look it provides me the next morning. The surface of my skin is definitely smoother, redness and blotchiness is reduced, plus I feel like I need a little less concealer than I may have required otherwise. Even my boyfriend has been getting in on the action, using a little before bed on his dry skin, while my mum has been putting it to the test too. She says: “My skin feels soft and bright in the morning. I’m constantly tired, but I definitely think Olay Regenerist it’s keeping my puffy eyes and dark circles at bay.” Good to know mum! Because Olay understand that quality sleep is a precious commodity for modern women, they’ve challenged me to ‘switch off’ for two weeks to encourage me to get into a better routine – and see the benefits not only in my energy levels, but my skin too. Juggling a career, family, friends, home life and hobbies, as well as suffering digital overload, leaves many of us simply unable to undertake ‘downtime’. Olay wants to help women ‘switch off’ each night to help ‘switch on’ their skin’s energy, so they’re working with Dr Nerina Ramlakhan (who has developed her top tips for quality sleep) and Anastasia Achilleos (facialist and Olay ambassador) who has designed a nightly massage to encourage women to indulge in some me-time. I’ll be putting their techniques to the test over the coming weeks to see if I can give myself a little boost; from putting down my phone at 9pm and opting for a book over television, to subtle massages and lifting techniques, there’s lots to keep me busy in the absence of my laptop. Stay tuned for an update and all the techniques you’ll need to try it yourself! In the meantime, let me know any top tips you have for getting a great night’s sleep below! 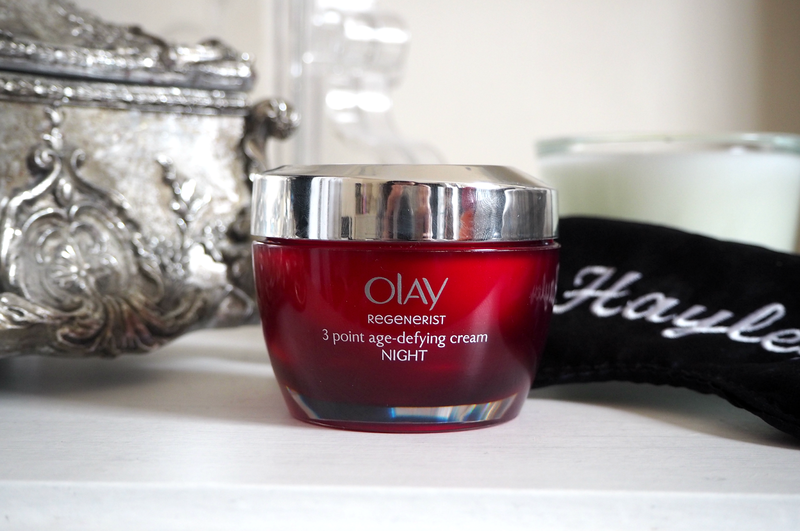 The Olay Regenerist 3 Point Age Defying Night Cream is available now from Boots, priced £29.99. This is a sponsored post on behalf of Olay. All opinions are my own. Thank for sharing.Also, I make it a point to avoid the news or anything negative prior to going to sleep.